Trusted by millions, Windex is America's #1 glass and surface cleaner. Windex Powerized Foaming Glass Cleaner Aerosol with Ammonia-D is a ready-to-use spray formula with foam boosters for maximum clean with minimal run-off. It is ideal for cleaning a wide variety of surfaces, including: glass, chrome, plastic, vinyl, porcelain, ceramic tile, Plexiglas, Formica, and more. Cleans with the power of Ammonia-D, an exclusive glass cleaning formula that cuts through grime without leaving unsightly streaks or films. This formula contains no chlorofluorocarbons (CFCs) or phosphorus, and leaves the clean, fresh scent of Windex behind. 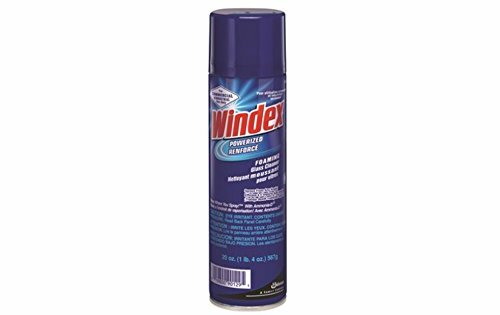 This package contains twelve 19.7-ounce aerosol cans of Windex Powerized Foaming Glass Cleaner with Ammonia-D.
Windex Powerized Foaming Glass Cleaner Aerosol with Ammonia-D is a ready-to-use spray formula with foam boosters for maximum clean with minimal run-off. It is ideal for cleaning a wide variety of surfaces, including: glass, chrome, plastic, vinyl, porcelain, ceramic tile, Plexiglas, Formica, and more. Cleans with the power of Ammonia-D, an exclusive glass cleaning formula that cuts through grime without leaving unsightly streaks or films. This formula contains no chlorofluorocarbons (CFCs) or phosphorus, and leaves the clean, fresh scent of Windex behind. This package contains twelve 19.7-ounce aerosol cans of Windex Powerized Foaming Glass Cleaner with Ammonia-D.
View More In Glass Cleaners. If you have any questions about this product by Windex, contact us by completing and submitting the form below. If you are looking for a specif part number, please include it with your message.